Kenneth and Jacquelyn Johnson talk about the death of their son Kendrick, whose body was found rolled up inside a wrestling mat. Attorney C.B. King also joins. The mysterious death of a Georgia teen has taken a bizarre twist with the revelation that an autopsy of his exhumed remains found his internal organs missing and his body stuffed with newspaper. The family of Kendrick Johnson, 17, of Valdosta, Ga., was "outraged" and "devastated" by the discovery and believes his death was a murder that is being covered up, a lawyer representing them said Thursday. Johnson, a three-sport athlete, was found dead on Jan. 11 in a rolled-up wrestling mat in his high school gym. State medical examiners concluded that he accidentally suffocated while trying to retrieve a sneaker. But his parents, Kenneth and Jacquelyn Johnson, were doubtful about that conclusion. "It didn't make any sense," Kenneth Johnson told MSNBC's Tamron Hall on Thursday. "We know how Kendrick is," Jacquelyn Johnson added. "We know he would have never crawled up in no mat." In June, they won a court order to have Kendrick's body exhumed for a second autopsy. What the private pathologist who performed the second autopsy found was shocking. The results came back in September. "There were no organs in there," Benjamin Crump, co-counsel for Kendrick's family, said. "He [also] concluded that it was a homicide, and that he died from blunt force trauma." The autopsy showed Kendrick suffered hemorrhaging on the right side of his neck. Organs from the teen's torso up to his skull had been removed and replaced with newspaper after his death, Crump said, something that disturbed his parents terribly. "They thought that they had their whole son returned to them. They only had half of their son returned to them," he said. All of his clothes were also missing. "It's very hard for we as parents to have to go through this ordeal," said Kenneth Johnson. Kendrick's body had been in three places after he died: possession of the local sheriff when the crime occurred; the Georgia Bureau of Investigation, which conducted the first autopsy in January; and the Harrington Funeral Home in Valdosta, which handled the embalming and burial, according to Crump. Harrington Funeral Home and the Valdosta sheriff did not return a request for comment from NBC News. Sherry Lang, director of public affairs at the Georgia Bureau of Investigation said, "We stand behind our medical examiner's office and their autopsy report on this case. We returned the organs with the body to the funeral home. It's our policy and it's our practice on every single autopsy that we do." On Thursday, Kendrick's parents announced they planned to seek legal action against government officials who may have had involvement in covering up their son's murder. "To find his organs are missing is just insult on top of injury," Crump said. "They're outraged. They've been outraged for the last nine months." He added that the death of the track, basketball, and football star, who he described as a "good kid," left the family "devastated." 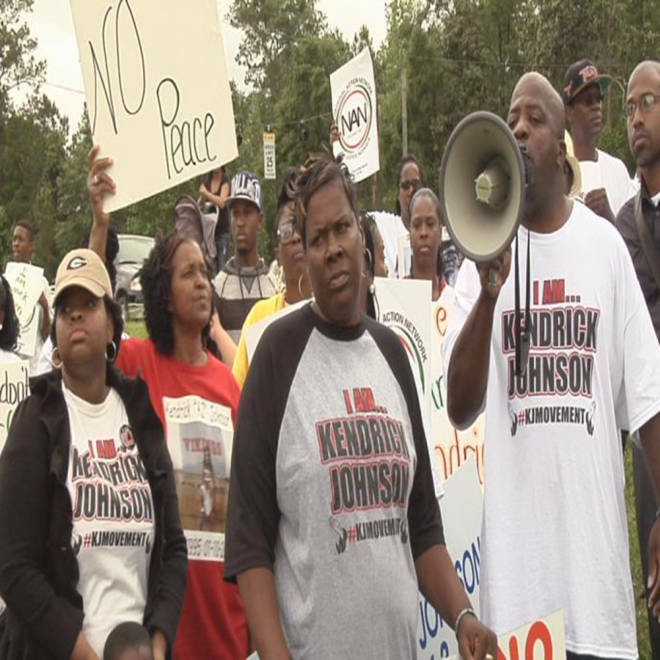 Family and friends of Kendrick Johnson and activists protest outside Lowndes High School in Valdosta, Ga., in May. "It's been heartbreaking," Jacquelyn Johnson told MSNBC. The family's attorney, C.B. King, told MSNBC he is seeking to get all the surveillance footage from the gymnasium where Kendrick died released — which the school has yet to grant him. "We know that there at least four video cameras, one of which is aimed directly in the area where the mat is that his body was located," King said. "What does this video show? We can't help but believe it would be the clearest proof of whether or not the sheriff's theory is correct. It would show him getting into the mat, or if doesn't show that, it would show how his body wound up in the gym the following morning." Lowndes County High School declined to comment. King said a U.S. attorney is examining Kendrick's file and is considering opening up an investigation into his case. Crump said Kendrick's parents feel the cover-up is limited to their son, but want to know why it happened. "A lot of people in the community believe they know who did this [the murder]," he said. "The question is why was it covered up. Right now we think that the truth is right under our noses and it's going to come out. This murder mystery will be solved." He would not disclose who the family suspected was responsible for the death.